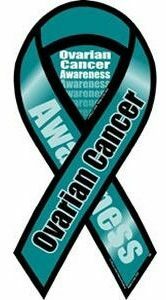 Ovarian cancer awareness refers to the education women on the characteristics of ovarian cancer, such as the symptoms and whom it affects. Ovarian cancer is the deadliest of all gynecological cancers and there is no effective screening test to detect it, so until there is a test, awareness is best. Early detection greatly increases survival, so knowing the symptoms to look out for is of paramount importance. A number of organizations around the world organize awareness campaigns for ovarian cancer. The importance of increasing awareness for this disease cannot be underestimated. A recent Australian study revealed that 1 in 5 Australian women can’t name one symptom of ovarian cancer. Ovarian cancer has been termed “the silent killer” as it was thought that it displayed no symptoms while it developed. However, it has recently been shown that most women experience at least one symptom of the disease in the year prior to their diagnosis. The National Breast and Ovarian Cancer Centre in Australia launched a campaign called “nobody knows your body like you do” and February has been established as the awareness month. Another important association in Australia is Ovarian Cancer Australia. They have a number of programs to help raise awareness of ovarian cancer, provide support networks for patients and recently set up a partnership with the Ovarian Cancer Study (AOCS), which is the only national ovarian cancer research program in Australia and one with a prominent international reputation. In the US, September is ovarian cancer awareness month, with teal being the symbolic color. The Ovarian Cancer Research Fund organizes a variety of events to raise funds for ovarian cancer research such as luncheons, walks and a text-a-thon in association with Electolux and Kelly Ripa, a TV celebrity. The cosmetic company L’Oreal Paris has been involved in campaigns to raise money for the ovarian cancer research fund, and has created the Color of Hope cosmetic collection and sponsored the prestigious L’Oreal Legends Gala and other events. Through these efforts they have helped raise more than $18 million towards life-saving research and awareness. In the UK, ovarian cancer awareness month is held in March. The Ovarian Cancer Action Group does a lot of work in the UK to educate women about the symptoms they should be looking out for, and also the characteristics of ovarian cancer, for example the fact that it mostly affects women over the age of 40, and it can run in families, so getting to know your family history is important. They also help raise funds for research. Have a look at the underlined websites to see how you can get involved in raising awareness for ovarian cancer in your country. The fact that the symptoms of ovarian cancer are vague and common to many other ailments can mean that women and also some doctors become complacent and don’t take action when they experience one or more symptoms for an extended period of time.